For the second consecutive the week the Seahawks hit the road for a nationally televised primetime game. The Seahawks share the Monday Night spotlight with the St. Louis Rams this week in the first matchup between these two teams this season. The Seahawks are 6-1 and are coming off a 34-22 win over the Arizona Cardinals in week 7. The Rams are 3-4 and not only did they lose to the Carolina Panthers last week, they also lost starting quarterback Sam Bradford to a torn ACL, which has ended his 2013 season. 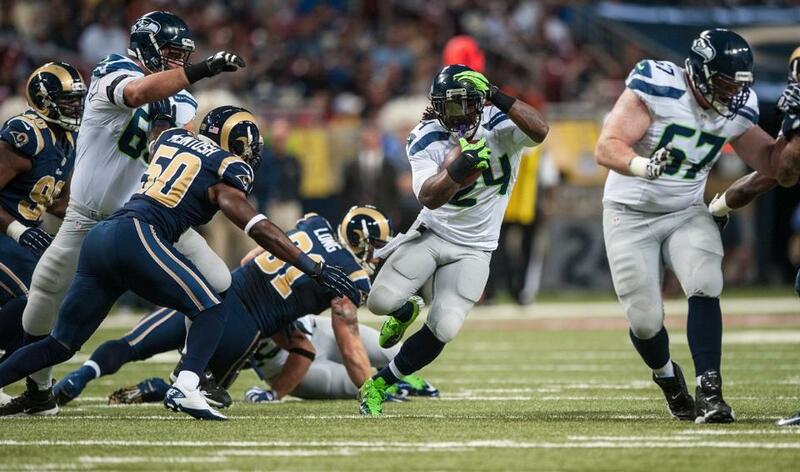 The Seahawks lead the all-time series with the Rams 18-12. Their last meeting came in the final regular season game of 2012. The Seahawks struggled but persevered, beating St. Louis 20-13 to finish the 2012 season at 11-5. There are several things to think about and look for this week both on and off the field. Let’s take a look at what I am looking at in week 8. As the weeks and wins have gone by the confidence in the locker room is as high as ever. My number one key to a victory this week is for the Seahawks to simply take this game one play at a time and not be overconfident. Before the season started I was ready to pencil in this game as a loss given the fact that it was a primetime game most likely in front of a sold out crowd in a place where we have struggled to win over the past few years against a team that could challenge for an NFC Wild-Card berth. Over the past 7 weeks these circumstances have changed dramatically and the Seahawks are now large favorites to win this game. I do not want to say this is a trap game but to show that we are a disciplined football team, we need to play just like how we played last week in Arizona; field-stretching offense, a dominating pass rush, and no turnovers. On offense this week the buzz has been around the possibility of Percy Harvin being active and playing for the first time this season. We have invested $67 million dollars in Harvin and although he has been cleared to come back, it has been announced he will not be active against St. Louis. Realistically, I expect Harvin to make his Seahawks debut in two weeks against the Atlanta Falcons. Not only will Harvin not play but I am curious to see the role Golden Tate is able to play this week after injuring his shoulder last week. He has been practicing this week but if the injury is still nagging it could affect how Tate plays. Sidney Rice is primed to have a breakout performance this week. 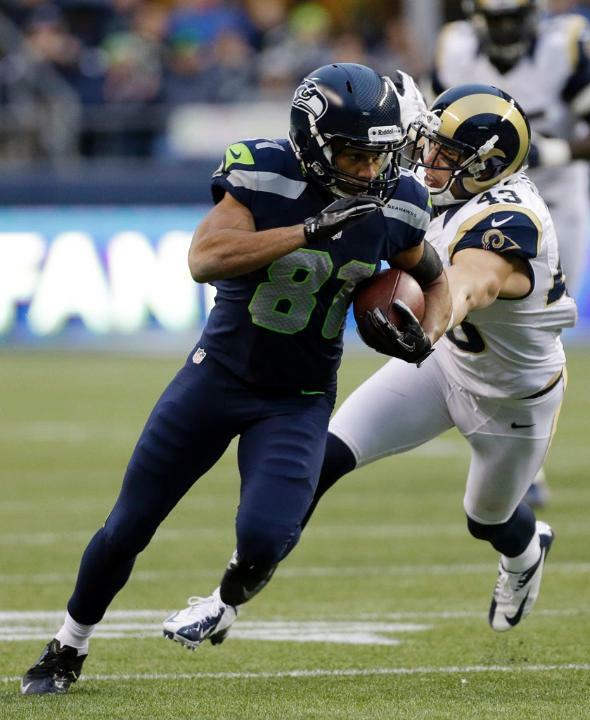 Rice made an impact last week catching a long touchdown from Russell Wilson. With the offense building momentum and Wilson trusting his receivers more, Rice could be Wilson’s primary deep threat should he decide to stretch the field against a St. Louis defense that gives up an average of 247 passing yards per game. An effective offensive performance may not be easy as the Rams have great talent throughout their defense and they play well at home given their 2-1 record inside the Edward Jones Dome. However they do boast the third-worst running defense in the league. Marshawn Lynch will be a focal point in our offensive gameplan and great production from Lynch will take the pressure off of Wilson and the passing game. The St. Louis Rams offensive line has given up an average of just over 2 sacks per game. The Seahawks sacked Carson Palmer 7 times last week. It will be necessary to put large amounts of pressure on the quarterback this week because I believe after watching tape of Rams quarterback Kellen Clemens that pressure will force him into making bad throws more than your typical backup quarterback. That will be a focus of the defense this week; how to force Clemens to make bad decisions. Much like with the offense, in a game where we are heavily favored it will be crucial to play mistake-free football. There is no reason why we shouldn’t be able to stop the battered Rams offense this week so if we can avoid bad penalties and end drives without giving up large amounts of yardage and points we will be victorious. The St. Louis Rams are in a big pickle on offense. With Sam Bradford out for the season with a torn ACL, Kellen Clemens will be the starting quarterback going forward. With Clemens suddenly thrown into the starting rotation it would be logical to think the Rams will want to run the ball to take the pressure off of the quarterback. The problem is that the Seahawks boast the 5th ranked run defense in the National Football League. Regardless, my X-Factor player of the Rams offense is running back Zac Stacy. Stacy has seen expanded playing time the past three weeks and has now surpassed Daryl Richardson and Isaiah Pead as the Rams starting running back. After two weeks gaining at least 78 yards, Stacy only gained 53 yards on 17 carries last week. His average yards per carry have also steadily decreased over the past 3 games. One thing that Stacy does extremely well is breaking tackles. It will be important for the Seahawks defense to wrap Stacy up to prevent him from gaining yards after contact; something that the Seahawks improved at greatly last week. I do not expect the St. Louis wide receivers to have a major impact, especially first-round rookie Tavon Austin who has been a major disappointment so far this season. If Kellen Clemens plays a conservative game which I believe he will, I expect tight end Jared Cook will see the majority of the targets short and in the middle of the field. Given the talent of the Seahawks and the worries of the Rams offense, the Rams defense has been greatly overshadowed in the days leading up to this game. St. Louis has a quite talented defense and they boast a solid mix of pass-rushing talent and good secondary play. Given the newfound confidence in Russell Wilson to stretch the field he will challenge the Rams secondary throughout the game. My defensive X-Factor player for the Rams is cornerback Trumaine Johnson. Johnson has the height of Legion of Boom cornerbacks Richard Sherman and Brandon Browner as well as using his body to record 31 tackles; 4th most of any St. Louis defender. Johnson also has one interception on the season. Given the height factor, expect Johnson to line up across from Sidney Rice for most of the game. If the Seahawks can avoid turning the ball over to this feisty Rams secondary and if the offensive line can protect Russell Wilson effectively we will be in good shape this week. There is one final note that cannot go unnoticed. The Seahawks/Rams game will be taking place at the exact same time of game 5 of the World Series. What makes this even more interesting is that the Edward Jones Dome and Busch Stadium are only one mile apart. St. Louis has been known for a long time as a true “baseball city” and even when the Rams have shown the slightest bit of success not many people seem to notice or care. I have heard rumors that the Rams will struggle to fill half of the stadium’s capacity on Monday night which could turn out to be a huge advantage for the Seahawks. There is surely a large part of the greater St. Louis area that would rather watch the Cardinals play in the World Series on television then actually attend the Rams game. Not only could this negatively affect the Rams on Monday, a poor showing of Rams fans could also propel the NFL to look into the possibility of a potential relocation of the Rams to a city like Los Angeles; something that has been talked about by the league as a possibility for the past few years. Random Thoughts: All bets are off but I expect the Seahawks to wear white jerseys this week… Mike Tirico and Jon Gruden have the call for ESPN… The referee for this week’s game is Gene Steratore… A win will solidify the Seahawks first non-losing record on the road for the first time since 2005 and it’s only October! That is pretty crazy… A win would also improve the Seahawks record against NFC rivals to 3-0 on the season… As much as I am a fan of primetime games it will be nice to get back to Sunday games starting next week… Here’s a thought from the “It’s a small world but not really” department: Rams quarterback Kellen Clemens currently wears #10 but during his stint with the Washington Redskins in 2011 he wore #1 in honor of his longtime friend Andy Collins who passed away in August of 2011. Collins wore #1 playing quarterback for Occidental College from 2004-2006. Collins was married to current Indiana Pacers sideline reporter Brooke Olzendam, whose father Dave was my speech teacher at Newport High School in 2005. What a strange yet interesting link between myself and Kellen Clemens… Hopefully the Seahawks can leave St. Louis injury-free. With our entire team getting healthier as a whole each week the last thing you want to see is a giant setback that could jeopardize our progress. Prediction: The Rams defense will show its presence early but the Seahawks will move the ball effectively shortly thereafter. 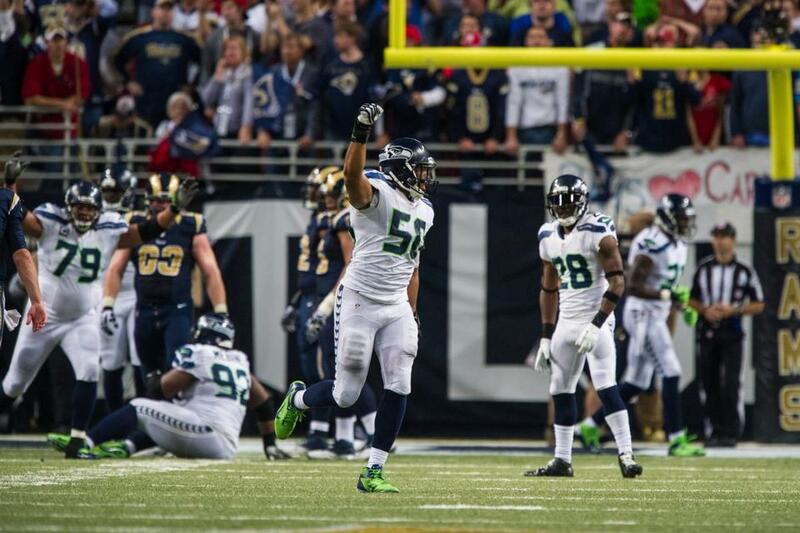 The Seahawks defense will completely shut down the Rams offense and the crowd will make a minimal impact on the game. Marshawn Lynch will run for 125 yards and a touchdown and Bobby Wagner will intercept a pass and record a sack of his own in his return to the lineup. 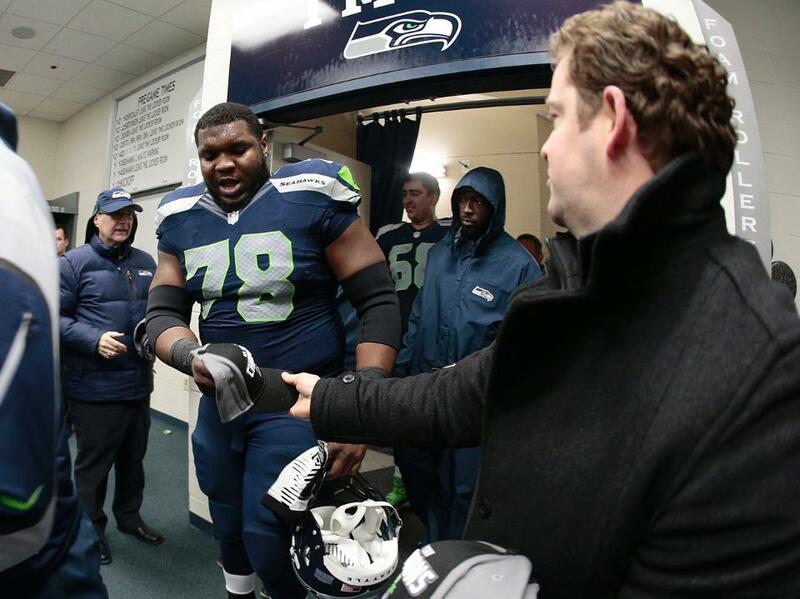 The Seahawks will head home 7-1 and will start preparations for the Tampa Bay Buccaneers. Late Monday night or early Tuesday morning is when I will have my Rams preview up for your viewing pleasure. Enjoy Monday Night Football everyone. Go Hawks!